They say history repeats itself. If Pop Culture is any evidence, the saying must be true. The 1980’s nostalgia is making a powerful comeback with Netflix shows like Stranger Things and reboots of classics like Boy Meets World, Fuller House, and My Little Pony. This dazzling classic has been entertaining kids since 1967, when it was invented by Joseph Burck. Eventually licensed to Hasbro, it lives on the list of Top 100 Games Ever Created. No wonder it’s survived over 50 years and three generations! I can still hear the jingle, played admist my favorite 1980’s Saturday morning cartoons: Lite-brite, Lite-Brite, turn on the magic of shining light! 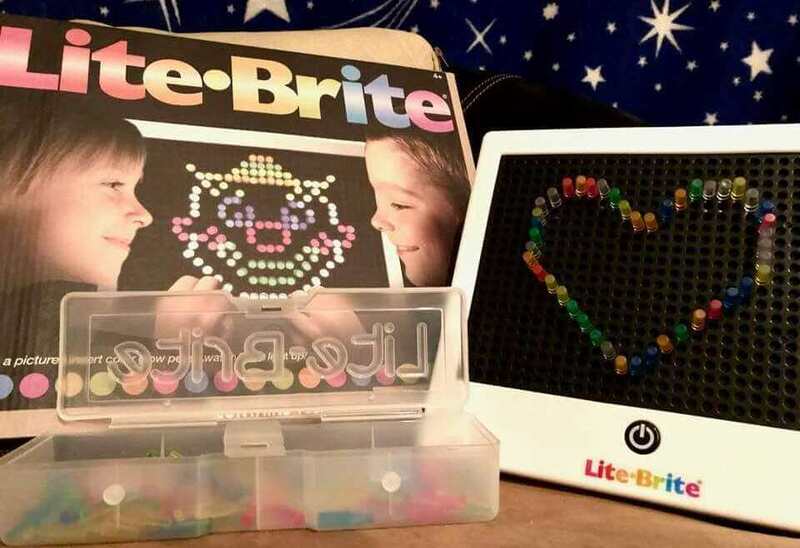 Today, the updated version of Lite-Brite from Basic Fun retains the original’s simplicity, and my daughter’s is a lot like the one I remember from childhood–and even the one my mom remembers from her youth. It’s still great for helping young kids with fine-motor skills and creativity and math games. My daughter creates unicorns and starry nights — and I don’t tell her that’s exactly what I used to do. My Little Pony was my favorite TV show in the 1980’s, so when My Little Pony: Friendship is Magic was released in 2010, I was happy to share my childhood favorite with my own kids. The new designs are fun and modernized for the new generation, but the heart is still there. Basic Fun has launched a 35th Anniversary collection of Hasbro’s original 1983 My Little Ponies that more closely resemble their classic appearance. If you remember, the 1980’s didn’t shy away from creepy story-lines and disturbing artwork. Movies like My Little Pony: The Movie (Secret of the Ooze) defined my childhood by teaching me the power of friendship. I’m glad to see the same ponies teaching the next generation of kids, who can enjoy them the same way I did. If My Little Pony was my favorite, Care Bears were a close second. My 1980’s bedroom was overflowing with ponies, Care Bears, Rainbow Brite, and Popples — all in jazzy, bold 1980’s hues. Now, my own kid’s bedroom is starting to look like mine. It’s allowing us to bond, whether she realizes it or not! Care Bears were created in 1981, just in time to grow up alongside me. I still have many of my original stuffed Care Bears, and the new line released by Just Play stays very true to the originals. All my favorites are still there — Grumpy Bear, Share Bear, Funshine Bear! And now, Nostalgia-Heart Bear (that’s me!) 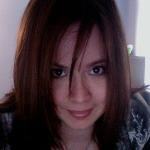 is going to share the song from the Care Bears Movie II: The Next Generation. I’d sing this song about “Growing Up,” while swinging on the swing-set, holding my Funshine Bear and dreaming about what my future would be. Like Lite-Brite, Simon is one of those toys that has survived generations, passed from Grandchild to Daughter to Granddaughter. It was launched in 1978 to resounding success. Simon has been updated many times, adding extra challenges by developing Simon Squared in 2000, a hexagonal-shaped Simon with additional buttons and a unique shape. After the popularity of rhythm games like Dance Dance Revolution, Hasbro developed Simon Stix, which included drumsticks and music. Simon Swipe is the latest incarnation of this game, utilizing a sleek modern shape, and challenging players to follow the pattern without ever “touching” Simon. Despite its growth and change, the simplistic nature of Simon helped it stay in vogue across the decades. The classic Simon game is sitting in our toy closet right now, and my kids have no idea I’m already a master. The vibrant oddness of the 80’s brought big, bright Tina Turner hair — and, not a far leap, Koosh Balls! The stretchy, snappy rubber band ball was perfect for a game of toss, or for flicking at your friends in class. In fact, in 1986 Scott Stillinger created the Koosh Ball in order to help his young kids learn to play catch. With over 2000 rubber filaments per ball, the popular line was described as “psychedelic sea urchins,” and expanded into keychains and footballs. And I’m sure we all remember the Koosh Creatures, with adorable animal faces and paws coming out of poofy Kooshes. My Koosh Panda lived on my nightstand. These funky, rebellious rubber balls have survived the 80’s and 90’s, brought to life for new Millennials. Again, simplicity and whimsy help this toy survive the test of time. I had several Puppy and Kitty Surprises when I was a kid. Who can forget the jingle? “Surprise! Surprise! Puppy Surprise! How many puppies are there inside? There could be three, or four, or five!” I always hoped to get the “jack pot” of discovering five kitties or puppies inside. Recently, Just Play released a new version: Lamb Surprise! When we excitedly opened the box to watch our new lamb give birth, I actually squealed with glee when I saw my childhood dream had come true — we had five babies! 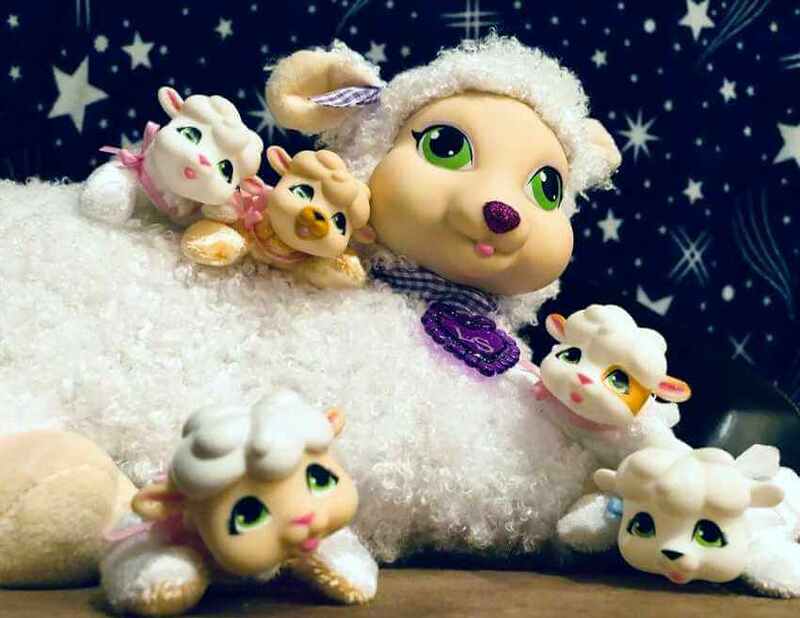 The tiny lambs are perfectly adorable, with delicately-painted features, chubby cheeks, and soft bodies. I actually took a moment to play with the mother lamb and her five babies. Childhood Nostalgia Achievement: Unlocked! This toy dates back to the 1960’s, when it was used as an education toy for children, meant to spark their imaginations. Come to think of it, I vaguely remember my mom telling me about having the same camera when she was a kid. I begged my parents for a Teddy Ruxpin back in the 1980’s. I’d never seen anything like him — a talking bear that can read stories for me and, according to the commercial, make my entire class like me and think I’m cool! In a world where Jim Henson’s muppets and Chuck E. Cheese animatronics signaled an awesome time, every kid wanted a Teddy Ruxpin. By high school, however, Furby had beaten out Ruxpin for a place in my heart. I remember the simple days of laying on my bedroom floor, making castles for my My Little Ponies to play in. So when I walk the toy store aisles and see my own child picking up all my old childhood favorites — it’s like watching my own inner child live on.